Over the last several decades, research and anecdotal experiences have accumulated an impressive evidential case that the development of mindfulness has positive benefits for the individual’s mental, physical, and spiritual life. Mindfulness appears to be beneficial both for healthy people and for people suffering from a myriad of illnesses. It appears to be beneficial across ages, from children to the elderly. And it appears to be beneficial across genders, personalities, race, and ethnicity. The breadth and depth of benefits is unprecedented. There is no other treatment or practice that has been shown to come anyway near the range of mindfulness’ positive benefits. With impacts so great it is important to know how to optimize the development of mindfulness. Mindfulness is defined as the “awareness that arises through paying attention, on purpose, in the present moment, non-judgmentally” (John Kabat-Zinn). This is the goal of mindfulness training. There are, however, a vast array of techniques for the development of mindfulness. They include a variety of forms of meditation, yoga, mindful movements, contemplative prayer, and combinations of practices. Some are recommended to be practiced for years while others are employed for only a few weeks. 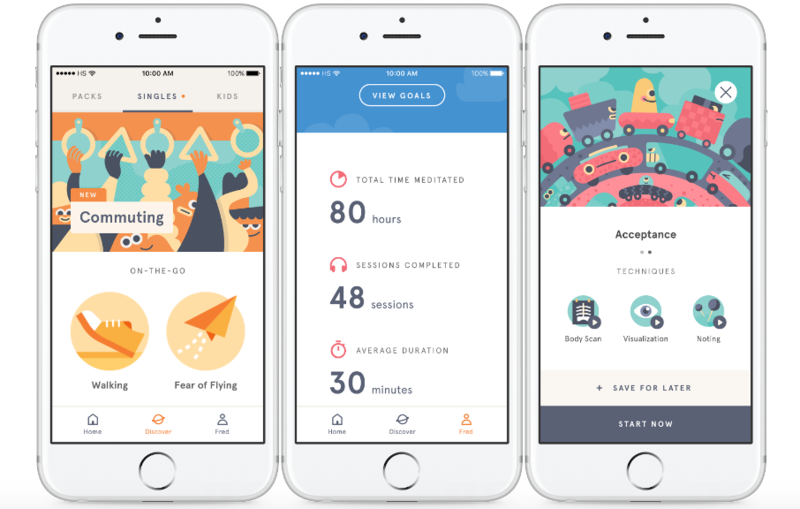 Regardless of the technique, they all appear to develop and increase mindfulness. It is unclear exactly how much training is essential to producing maximum benefits. In today’s Research News article “Efficacy of 8- and 4-Session Mindfulness-Based Interventions in a Non-clinical Population: A Controlled Study.” See summary below or view the full text of the study at: http://journal.frontiersin.org/article/10.3389/fpsyg.2017.01343/full?utm_source=F-AAE&utm_medium=EMLF&utm_campaign=MRK_368025_69_Psycho_20170822_arts_A, Demarzo and colleagues recruited college students and randomly assigned them to a no-treatment control condition or to receive either a 4-week or 8-week Mindfulness-Based Stress Reduction (MBSR) programs that met once a week for 2 hours. MBSR consists of body scan, meditation, and mindful movement practice. Participants were also request to practice at home each day. Participants were measured before and after training and 6 months later for mindfulness, self-compassion, anxiety, depression, positive and negative emotions, and resilience. 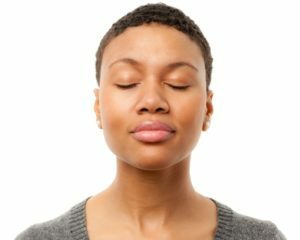 They found that both the 4-week and 8-week mindfulness training groups in comparison to the control condition had, after training and at the 6-month follow-up, significantly improved mindfulness overall and in the mindfulness facets of describing, observing, acting with awareness, non-judging, and non-reacting, and in positive and negative emotions. On the other hand, only the 8-week mindfulness training produced a significant increase in self-compassion and decreases in anxiety and depression. Mindfulness training has been shown in prior studies to improve mindfulness, emotions, anxiety, depression, self-compassion, and resilience. So, the benefits found in this study are not surprising. But the results on the amount of practice are interesting and suggest that considerable benefits accrue to participants in a short, 4-week, mindfulness training but for the full benefits an 8-week program is needed. Hence, unless an abbreviated program is needed for pragmatic reasons, training should be conducted for the full 8-week training period. Background: Many attempts have been made to abbreviate mindfulness programmes in order to make them more accessible for general and clinical populations while maintaining their therapeutic components and efficacy. The aim of this study was to assess the efficacy of an 8-week mindfulness-based intervention (MBI) programme and a 4-week abbreviated version for the improvement of well-being in a non-clinical population. Method: A quasi-experimental, controlled, pilot study was conducted with pre-post and 6-month follow-up measurements and three study conditions (8- and 4-session MBI programmes and a matched no-treatment control group, with a sample of 48, 46, and 47 participants in each condition, respectively). Undergraduate students were recruited, and mindfulness, positive and negative affect, self-compassion, resilience, anxiety, and depression were assessed. Mixed-effects multi-level analyses for repeated measures were performed. Results: The intervention groups showed significant improvements compared to controls in mindfulness and positive affect at the 2- and 6-month follow-ups, with no differences between 8- vs. 4-session programmes. The only difference between the abbreviated MBI vs. the standard MBI was found in self-kindness at 6 months, favoring the standard MBI. There were marginal differences in anxiety between the controls vs. the abbreviated MBI, but there were differences between the controls vs. the standard MBI at 2- and 6-months, with higher levels in the controls. There were no differences in depression between the controls vs. the abbreviated MBI, but differences were found between the controls vs. the standard MBI at 2- and 6-months, favoring the standard MBI. There were no differences with regard to negative affect and resilience. Conclusion: To our knowledge, this is the first study to directly investigate the efficacy of a standard 8-week MBI and a 4-week abbreviated protocol in the same population. Based on our findings, both programmes performed better than controls, with similar effect size (ES). The efficacy of abbreviated mindfulness programmes may be similar to that of a standard MBI programme, making them potentially more accessible for a larger number of populations. Nevertheless, further studies with more powerful designs to compare the non-inferiority of the abbreviated protocol and addressing clinical populations are warranted. Psychological well-being is sometimes thought of as a lack of mental illness. But, it is more than just a lack of something. It is a positive set of characteristics that lead to happy, well-adjusted life. These include the ability to be aware of and accept one’s strengths and weaknesses, to have goals that give meaning to life, to truly believe that your potential capabilities are going to be realized, to have close and valuable relations with others, the ability to effectively manage life issues especially daily issues, and the ability to follow personal principles even when opposed to society. But, stress can interfere with the individual’s ability to achieve these goals. When highly stressed, resilience is required to cope with the stress and continue on the path to psychological well-being. Schizophrenia is the most common form of psychosis, affecting about 1% of the population worldwide. In many cases it is so debilitating that institutionalization is required. But, the symptoms of psychoses often do not appear until early adulthood. So, many carry on relatively normal lives including marriage prior to the onset of debilitating symptoms. This can result in wives having to cope with the institutionalization of their husbands, having to live alone, replace lost income, and withstand the societal stigma of having a mentally ill spouse. The resultant stress can exacerbate an already difficult situation. Mindfulness has been shown to increase resilience and reduce the psychological and physiological responses to stress. So, it is reasonable to infer that mindfulness training may help increase resilience in the wives of institutionalized individuals with schizophrenia. In today’s Research News article “The Efficacy of Mindfulness-Based Cognitive Therapy on Resilience among the Wives of Patients with Schizophrenia.” See summary below or view the full text of the study at: https://www.ncbi.nlm.nih.gov/pmc/articles/PMC5449888/, Solati recruited wives whose husbands were diagnosed with schizophrenia and institutionalized and randomly assigned them to a no-treatment control group or to receive and 8-week, once a week for 90 minutes, program of Mindfulness-Based Cognitive Therapy (MBCT). MBCT involves mindfulness training, containing sitting and walking meditation and body scan, and cognitive therapy to alter how the patient relates to the thought processes that often underlie difficult emotions. The women were measured before and after training for resilience. They found that following the intervention the women who received Mindfulness-Based Cognitive Therapy (MBCT) had a significant, 10%, increase in resilience in comparison to the control group. There is a need to conduct a randomized controlled trial with an active control condition to verify these findings. Nevertheless, mindfulness training appeared to improve resilience. This suggests that MBCT may assist wives whose husbands are diagnosed with schizophrenia and institutionalized to better cope with the resultant stress. This may better equip the women to withstand their difficulties and retain their own well-being. So, improve resilience in spouses of schizophrenia patients with mindfulness. The wives of patients with schizophrenia experience high levels of stress due to their spouses’ disease, which leads to certain problems and decreased adaptability and efficiency in them. This study investigated the efficacy of Mindfulness-Based Cognitive Therapy (MBCT) on resilience in schizophrenia patients. In this quasi-experimental study, 40 wives of patients with schizophrenia (20 assigned to experimental group and 20 to control group) whose husbands were kept in rehabilitation centers for mental disorders were enrolled according to convenience sampling. In the experimental group, the therapeutic protocol of MBCT was conducted. Accordingly, the patients were encouraged to process the experiences in a non-judgmental manner as they have been formed, and to change their relationship with and embrace challenging thoughts and feelings. Meanwhile, the control group underwent no intervention. The research instrument was Connor-Davidson Resilience Scale. Data were analysed by ANCOVA in SPSS 16. At post-test, mean resilience score of the experimental group (77.95±4.71) was much higher than that of the control group (71.75±5.81). There was a significant difference in the mean resilience score at post-test between the experimental and control groups (p<0.05). Training MBCT strategies was effective on resilience in the wives of schizophrenia patients. Therefore, this approach can be incorporated into mental health-related interventions for the families of patients with psychiatric disorders such as schizophrenia. Stress is epidemic in the western workplace with almost two thirds of workers reporting high levels of stress at work. In high stress occupations, like healthcare, burnout is all too prevalent. It is estimated that over 45% of healthcare workers experience burnout. Currently, over a third of healthcare workers report that they are looking for a new job. Burnout is the fatigue, cynicism, emotional exhaustion, sleep disruption, and professional inefficacy that comes with work-related stress. It not only affects the healthcare providers personally, but also the patients, as it produces a loss of empathy and compassion. Burnout it is a threat to the healthcare providers and their patients. In fact, it is a threat to the entire healthcare system as it contributes to the shortage of doctors and nurses. Preventing burnout has to be a priority. But, it is beyond the ability of the individual to change the environment to reduce stress and prevent burnout, so it is important that methods be found to reduce the individual’s responses to stress; to make the individual more resilient when high levels of stress occur. Contemplative practices have been shown to reduce the psychological and physiological responses to stress. Indeed, mindfulness has been shown to be helpful in treating and preventing burnout, increasing resilience, and improving sleep. https://www.ncbi.nlm.nih.gov/pmc/articles/PMC5376833/, Mathad and colleagues recruited nursing students who completed measures of mindfulness, resilience, empathy and perseverative thinking. They found that the higher the levels of mindfulness the higher the levels of resilience even in a multiple regression model considering the other measures. They also found that higher levels of resilience were, in turn, associated with higher levels of empathy and lower levels of repeated negative thinking and unproductive negative thinking. This is a correlative study so causation cannot be determined. But, the findings fit with previous research where mindfulness was manipulated through training and caused an increase in resilience. So, it is reasonable to conclude that the current findings were probably due to mindfulness improving resilience. Hence, it appears that mindfulness increases resilience and this in turn reduces negative thinking and improves empathy. This all suggests that mindfulness would tend to protect healthcare providers from the effects of stress, making the individuals more resilient and less likely to experience burnout. So, spring back from stress with mindfulness. A growing body of literature recognizes the importance of resilience in the nursing profession. Both mindfulness and resilience aid in handling stress, stress increases the risk of rumination and/or worry especially in females and they are more empathetic than other healthcare students. To identify correlates and predictors of the resilience among nursing students. This is a descriptive correlation study and we have recruited 194 participants (1-4th year B.Sc Nursing) from Government College of Nursing and NIMHANS College of Nursing in Bangalore, India. 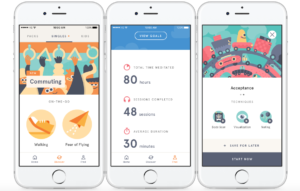 The following instruments were used to collect the data, Freiburg Mindfulness Inventory (FMI), Toronto Empathy Questionnaire (TEQ), Perseverative Thinking Questionnaire (PTQ) and Connor–Davidson Resilience Scale (CD-RISC). Data was analysed using Pearson’s correlation test and multiple regression analysis. Resilience is significantly correlated with mindfulness, perseverative thinking and empathy in nursing students. Based on regression analysis this model accounted for almost 33% of variance in resilience. This result is of interest as mindfulness alone explained 23% of the variance and unproductive Repeated Negative Thinking (RNT) and RNT consuming mental capacity predicted 8% and 2% respectively. These results support the importance of resilience and mindfulness in nursing students. Hence, resilience and/or mindfulness enhancing interventions should be inculcated in nursing education. Psychological well-being is sometimes thought of as a lack of mental illness. But, it is more than just a lack of something. It is a positive set of characteristics that lead to happy, well-adjusted life. These include the ability to be aware of and accept one’s strengths and weaknesses, to have goals that give meaning to life, to truly believe that your potential capabilities are going to be realized, to have close and valuable relations with others, the ability to effectively manage life issues especially daily issues, and the ability to follow personal principles even when opposed to society. But, the aging process to some extent interferes with the individual’s ability to achieve these goals as a result of a systematic progressive decline in every system in the body, the brain included, producing declines in mental abilities including impairments in memory, attention, and problem solving ability. Religion and spirituality have been promulgated as solutions to the challenges of life both in a transcendent sense and in a practical sense. What evidence is there that these claims are in fact true? The transcendent claims are untestable with the scientific method. But, the practical claims are amenable to scientific analysis. There have been a number of studies of the influence of religiosity and spirituality on the physical and psychological well-being of practitioners mostly showing positive benefits, with spirituality encouraging personal growth and mental health. Research from this body of work has shown that spirituality and religiosity serve as protective factors against a variety of psychiatric conditions, including depressive disorders, anxiety disorders, suicide, burnout, eating disorders, substance-related disorders and addiction recovery. Vahia and colleagues examine the relationships between religiosity/spirituality and well-being in aging women. They examined measures obtained in 2005 from the “Women’s Health Initiative (WHI), a large NIH-funded multi-center study of the predictors of morbidity and mortality among post-menopausal women.” These included measures of successful aging, religiosity/spirituality, resilience, stressful life events, optimism, attitude toward aging, depression, and physical and mental functioning. They analyzed these measures with bivariate and multivariate regression analyses. They found that high levels of religiosity/spirituality were directly associated with high levels of morale toward aging, resilience, and optimism and low levels of stressful life events. Applying a multiple regression, however, they found that religiosity/spirituality was only significantly associated with higher resilience, and demographic issues of lower income, lower education, and lower likelihood of being in a committed relationship. 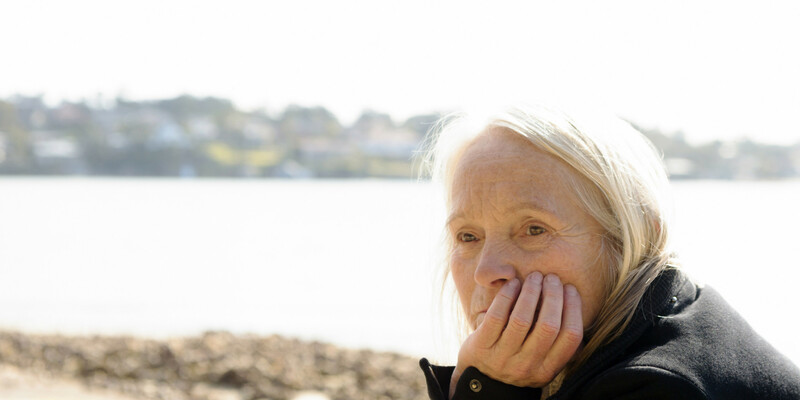 Hence, in these postmenopausal women, spirituality appeared to be associated with resilience and negative life circumstances. It should be emphasized, though, the results are correlational and therefore do not demonstrate causal connections. The association with resilience is particularly interesting. It suggests that aging women who have high levels of spirituality are also highly resilient and are therefore better able to cope with problematic life circumstances. It remains for future research to investigate whether being spiritual promotes resilience, the other way around, or some third factor may be responsible for the covariation. The role of spirituality in the context of mental health and successful aging is not well understood. In a sample of community-dwelling older women enrolled at the San Diego site of the Women’s Health Initiative study, we examined the association between spirituality and a range of variables associated with successful cognitive and emotional aging, including optimism, resilience, depression, and health-related quality of life (HRQoL). Overall, 40% women reported regular attendance in organized religious practice, and 53% reported engaging in private spiritual practices. Several variables were significantly related to spirituality in bivariate associations; however, using model testing, spirituality was significantly associated only with higher resilience, lower income, lower education, and lower likelihood of being in a marital or committed relationship. Our findings point to a role for spirituality in promoting resilience to stressors, possibly to a greater degree in persons with lower income and education level. Future longitudinal studies are needed to confirm these associations. Stress is epidemic in the western workplace with almost two thirds of workers reporting high levels of stress at work. In high stress occupations, like healthcare, burnout is all too prevalent. It is estimated that over 45% of healthcare workers experience burnout. Currently, over a third of healthcare workers report that they are looking for a new job. Nearly half plan to look for a new job over the next two years and 80% expressed interest in a new position if they came across the right opportunity. Burnout is the fatigue, cynicism, emotional exhaustion, sleep disruption, and professional inefficacy that comes with work-related stress. It not only affects the healthcare providers personally, but also the patients, as it produces a loss of empathy and compassion. Sleep disruption is an important consequence of the stress. “Poor or inadequate sleep can contribute to poor personal health and burnout and adversely affect the quality of care” (Kemper et al. 2016). Burnout it is a threat to the healthcare providers and their patients. In fact, it is a threat to the entire healthcare system as it contributes to the shortage of doctors and nurses. Preventing burnout has to be a priority. But, it is beyond the ability of the individual to change the environment to reduce stress and prevent burnout, so it is important that methods be found to reduce the individual’s responses to stress; to make the individual more resilient when high levels of stress occur. Contemplative practices including yoga practice have been shown to reduce the psychological and physiological responses to stress. Indeed, mindfulness has been shown to be helpful in treating and preventing burnout, increasing resilience, and improving sleep. Chamberlain and colleagues recruited third-year nursing students and had them complete measures of mindfulness, resilience, compassion, and burnout. They found that for these nursing students the single best predictor of resilience was mindfulness, particularly acceptance; accepting without judging things just as they are. The next most powerful predictor was expectancy for a successful next career step. High levels of mindfulness were also associated with increased compassion and reduced fatigue in compassion. The results are encouraging, but must be interpreted with caution. The study was correlational and nothing was manipulated, so causation cannot be determined. But the results suggest that mindfulness is very important for resilience. In particular the ability to take what comes and accept it without judgement helps to maintain the individual’s resilience. Since resilience is important for being able to cope with and bounce back from the stress of the occupation, mindfulness may be important for preventing burnout. In addition, the results suggest that mindfulness is associated with persistence of compassion, an important capacity for nurses. These results need to be followed up with a randomized controlled trial in which these nursing students are trained in mindfulness, to determine if mindfulness is causally responsible for these important benefits. If this was confirmed it would strongly suggest that mindfulness training be included in the nursing curriculum; improving resilience and compassion, making them better nurses who are less likely to burn out. So, improve resilience with mindfulness. Background: Nursing students will graduate into stressful workplace environments and resilience is an essential acquired ability for surviving the workplace. Few studies have explored the relationship between resilience and the degree of innate dispositional mindfulness, compassion, compassion fatigue and burnout in nursing students, including those who find themselves in the position of needing to work in addition to their academic responsibilities. Aim: This paper investigates the predictors of resilience, including dispositional mindfulness and employment status of third year nursing students from three Australian universities. Design: Participants were 240 undergraduate, third year, nursing students. Participants completed a resilience measure (Connor–Davidson Resilience Scale, CD‐RISC), measures of dispositional mindfulness (Cognitive and Affective Mindfulness Scale Revised, CAMS‐R) and professional quality of life (The Professional Quality of Life Scale version 5, PROQOL5), such as compassion satisfaction, compassion fatigue and burnout. Method: An observational quantitative successive independent samples survey design was employed. A stepwise linear regression was used to evaluate the extent to which predictive variables were related each to resilience. Results: The predictive model explained 57% of the variance in resilience. Dispositional mindfulness subset acceptance made the strongest contribution, followed by the expectation of a graduate nurse transition programme acceptance, with dispositional mindfulness total score and employment greater than 20 hours per week making the smallest contribution. This was a resilient group of nursing students who rated high with dispositional mindfulness and exhibited hopeful and positive aspirations for obtaining a position in a competitive graduate nurse transition programme after graduation. To help overcome unhappiness, stress, and burnout, mindfulness practices have been implemented in the workplace. In fact, it has become very trendy for business to incorporate meditation into the workday to help improve productivity. For example, Google offers “Search Inside Yourself” classes to teach mindfulness at work. But, although there is a lot of anecdotal evidence of meditation improving work performance, there is actually very little systematic research on its effectiveness. or see summary below. Ravalier and colleagues reviewed the published research literature on the effects of mindfulness practices implemented in the work environment. They included only full-length peer-reviewed journal articles published since 2000. They found that mindfulness practices produced significant reductions in perceived stress and improvements in vigor, psychological health, and resilience in the employees. In other words, they found very promising research findings, suggesting marked improvements in employee psychological well-being produced by mindfulness practices. They point out, however, that there is a need for longer-term follow-up studies to ascertain whether mindfulness practices have lasting effects in the workplace. These results complement the research findings of mindfulness effects in many other contexts. It has been shown in general to reduce the psychological and physical responses to stress and to improve mental and physical health. This suggests that mindfulness practices may improve health and productivity and reduce burnout in modern workers. Beyond overcoming the negative effects of the work environment, the workplace has been postulated to be an excellent environment to practice the Buddha’s Eightfold Path for spiritual development and the relief of suffering. 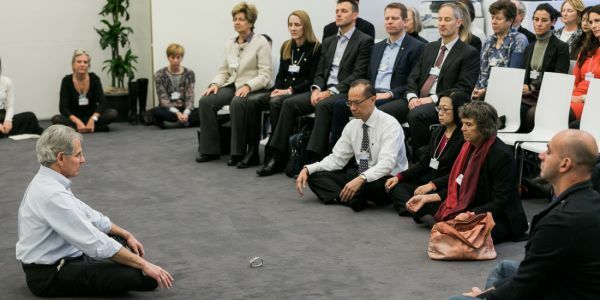 So, improve employee well-being with mindfulness. Background A variety of workplace-based interventions exist to reduce stress and increase productivity. However, the efficacy of these interventions is sometimes unclear. Aims To determine whether complementary therapies offered in the workplace improve employee well-being. Methods We performed a systematic literature review which involved an electronic search of articles published between January 2000 and July 2015 from the databases Cochrane Central Register of Controlled Trials, PsycINFO, MEDLINE, AMED, CINAHL Plus, EMBASE and PubMed. We also undertook a manual search of all applicable article reference lists to ensure that no relevant studies were missed. We only selected published, full-length, English-language, peer-reviewed journal articles. Articles had to address the research objective using valid and reliable measures. We excluded articles concerning return to work or whose populations had been adversely affected by work resulting in the development of health issues. Results We included 10 articles in the review from 131 identified. Mindfulness and meditation-based interventions were most effective in improving workplace health and work performance; the latter demonstrating some evidence of maintaining gains up to 3 months later. The evidence for relaxation interventions was inconclusive. Conclusions Mindfulness and meditation interventions may be helpful in improving both psychosocial workplace health and work performance, but long-term efficacy has yet to be fully determined. With the advent of managed care and the Affordable Healthcare Act in the U.S., primary healthcare providers have become a critical component of the healthcare system. Unfortunately, there is a marked shortage of these providers. It is estimated that in the U.S. there are over 9,000 fewer primary care physicians than needed. The shortages are not just due to training insufficient numbers of healthcare providers but also due to high turnover rates. In part because of the shortage and high patient loads, primary healthcare providers experience high stress and burnout. They experience a loss of enthusiasm for work, feelings of cynicism, and a low sense of personal accomplishment. In a recent survey 46% of all physicians responded that they had burnout. Currently, over a third of healthcare workers report that they are looking for a new job. Nearly half plan to look for a new job over the next two years and 80% expressed interest in a new position if they came across the right opportunity. Since there is such a great need to retain primary healthcare providers, it is imperative that strategies be identified to decrease stress and burnout. Burnout is not a unitary phenomenon. In fact, there appear to be a number of subtypes of burnout. The overload subtype is characterized by the perception of jeopardizing one’s health to pursue worthwhile results, and is highly associated with exhaustion. The lack of development subtype is characterized by the perception of a lack of personal growth, together with the desire for a more rewarding occupation that better corresponds to one’s abilities. The neglect subtype is characterized by an inattentive and careless response to responsibilities, and is closely associated with inefficacy. Montero-Marin and colleagues investigate the relationship of resilience, mindfulness, and emotions to burnout in 622 Spanish primary care physicians. Using sophisticated statistical techniques, they found that the three types of burnout were highly positively associated, with high levels of each associated with high levels of all the other types. They also found that mindfulness and resilience were highly related, with higher levels of mindfulness associated with higher levels of resilience. The overload type of burnout was directly associated with both negative emotions and mindfulness. In addition, both mindfulness and resilience appeared to affect overload indirectly by reducing negative emotions and thereby reducing overload burnout. The lack of development type of burnout was negatively associated with positive emotions and resilience was positively associated with positive emotions. So, resilience appeared to affect lack of development burnout by increasing positive emotions which in turn decrease lack of development burnout. Thereby, high levels of resilience were associated with low levels of lack of development. Finally, they found that resilience was negatively related to neglect burnout such that the higher the levels of resilience, the lower the neglect burnout. These are complex interrelationships. But in general they suggest that the mindfulness and the resilience of the physicians were highly related and worked in consort to reduce all types of primary care physician burnout and they do so, at least in part, by affecting the positive and negative emotions of the physicians. They may do so by different mechanisms, mindfulness by reducing the psychological and physical responses to stress and resilience by increasing the ability to withstand the stress. Regardless, burnout doctor burnout with mindfulness.